Have you ever had an intense itch you cannot scratch hard enough to relieve? Occasionally, dogs can experience that too. That said, a dog who frequently scratches, licks or bites at his skin can immediately make us jump to the conclusion the dog has fleas or other pests. While this is one possible explanation for this behavior called "puritus", there are other reasons he may feel the need for a good scratch. Here is a list of common causes of skin irritation in dogs, and how to know when it's time to see the vet. First, it is good to note there are ways to treat pups with fleas, ticks, mites, and other uninvited guests that may be setting up house on your pet. Pests might be worth ruling out before moving on to other causes as some of these critters can transfer to humans. Look for signs of these little buggers such as small black or red specks around the irritated area, hair loss, red patches, lesions, or pale gums. If you suspect fleas, mites or other parasites, it is a good idea to take your pet into the veteranarian for a thorough screening. Your vet will be able to detect any unwanted clingers giving your pup the power to once again be super hugable. Also, using preventative tablets, sprays and shampoos while limiting outdoor wooded and high-grass exposure can be your best weapons against this threat. Plant pollen can be rough on dogs too! Just as humans can have environmental allergies resulting in itchy eyes or skin, dogs can also have a reaction to certain allergens. If your dog bites or licks his paws after being outside, try letting him wear boots when outdoors or wipe his paws with a wet towel to remove the allergens. Baths with shampoo made for irritated skin can help as well. Allergy testing might be in order for those dogs who suffer with the constant irritation, despite trying other treatment measures. Ask your vet if this is a good course of action for your dog's situation. I'm allergic to my food. Thankfully, the more common food allergies are typically easier to diagnose and treat by a simple elimination diet than environmental allergies. For those suspecting their dogs may be more itchy after eating, the theory can be tested by removing the top food allergens from the dog's diet for a couple of weeks to see if the scratching behavior lessens. Examples of common food allergens for dogs are peanut butter, any primary source of protein, wheat, soy, fillers and additives. If the issue is food-related, a food elimination diet should be effective when the cause is an allergic reaction to that removed item. The tricky bit can be diagnosing more than one allergen. Another challenge can be choosing the right food item to eliminate when it is not one of the top most common reaction-producing foods. Pet owners can try offering relief at home by preparing the dog's meals themselves using food items not typically found to cause an allergic reaction. Although a little time consuming, the good news with this method is you will see the behavior go away when allergies are in fact the underlying issue as long as you are controlling the diet. Your vet may know of some tasty yet healthy dog food brands or recipes to try during this elimination period as you look for the source of your dog's discomfort. The Dog Advisor is another great resource for allergy-friendly commercial brand options. Does anyone have any lotion? Winter months or living in locations with low humidity levels can wreak havoc on anyone's skin, including your pet's. You will know if this is at least pat of the reason your dog feels so itchy by looking on the dog's skin for flakes or dandruff. It is important to note the dry skin might be a symptom of an allergic reaction. Try adding omega 3's and digestive enzymes to your dog's food while limiting baths and wiping down your dog after being outdoors with a damp cloth. If you suspect allergies are at play, a food elimination diet as mentioned above may prove useful in uncovering the irritant. Check with your vet about more ways to allieviate your dog's dry skin discomfort. Red itchy ears and paws? Oh my! There are trending videos showing dogs shaking their heads seemingly in response to a question. As long as that head shake is once in a while, it's perfect for Fido's starring role. 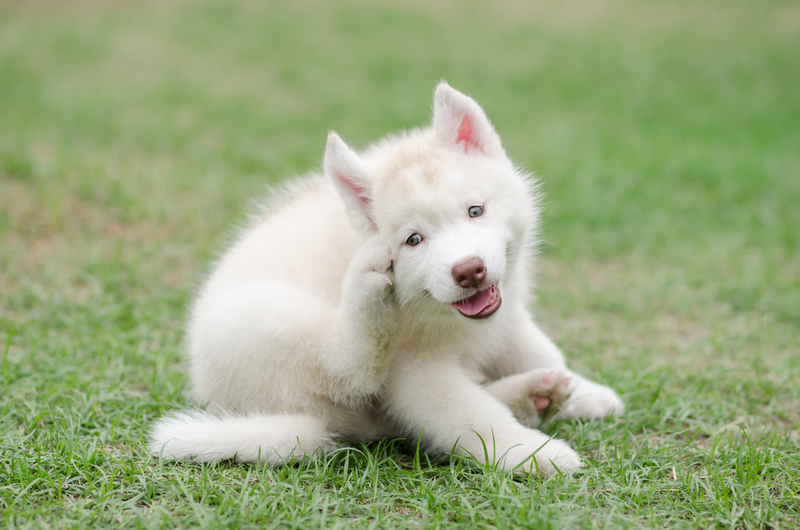 If he shakes his head on a consistent basis or paws at his ears, chances are he needs some parental action to help him feel less itchy. Wax build up, hormones, mites, yeast, viruses, allergies and more can cause intense itching in the ears. The same goes for biting and licking his paws. Most of that same list of irritants can create extreme discomfort in between your dog's toes. It can be difficult to distinguish the true cause of the irritation. Therefore, when you notice excessive head shaking, biting, licking, scratching or red patches inside his ears or in between his toes, a visit the vet is necessary for a proper diagnosis and treatment for itchy ears or paws. There are many reasons your dog could be feeling itchy. In addition to those mentioned, stress and hormone changes can lead to a scratching behavior. A food elimination diet where allergies are suspected and looking for redness, swelling, black or red specks, dandruff or flakes, and other symptoms can help you and your vet determine the true basis for the behavior that should result in an effective treatment that will hopefully have your dog feeling relief in no time! Hours: Because all of our dogs are in private homes, the Adoption Application must be completed before we can allow access to see the dog.